This image was first published in 1898 as a portrait of Emily Bronte and has been reproduced many times since but it is based on a portrait of Anne Bronte. The Bronte's ex-servant, Martha Brown, died in 1880 and her collection of Bronte relics were distributed amongst her family. A (collodion) photo on glass of the 'Pillar Portrait' passed to her sister Tabitha Ratcliffe. The original painting (right) was in Ireland, hidden away in the house of Charlotte's widower, Arthur Bell Nicholls, and not discovered until 1914. "The photograph you enclosed does bear a resemblance to the picture of the three sisters - it is just possible that Martha Brown had it copied before we left Haworth - The likenesses are very bad - The left hand corner has something of the expression of Anne - The others I should not recognise." It was a poor image so some of the faces were retouched and Shorter used it to illustrate an article "Relics of Emily Bronte" in Woman at Home, August, 1897. This was the first time the portrait had been published. 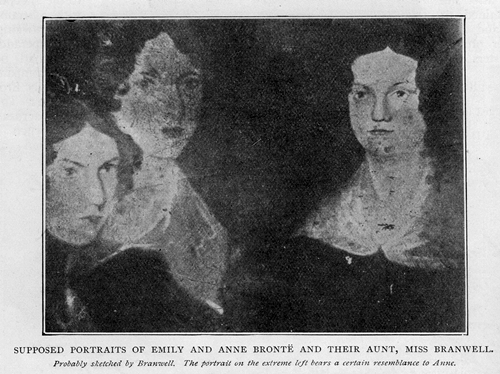 The title reads in capitals: "SUPPOSED PORTRAITS OF EMILY AND ANNE BRONTE AND THEIR AUNT, MISS BRANWELL." which infers that Emily is on the left but underneath in very small italics reads: "The portrait on the extreme left bears a certain resemblance to Anne." This suggests that Clement Shorter thought the figure on the left to be Emily, hence the title, but felt that he had to include what he was told by Mr Nicholls, which is almost unreadable. 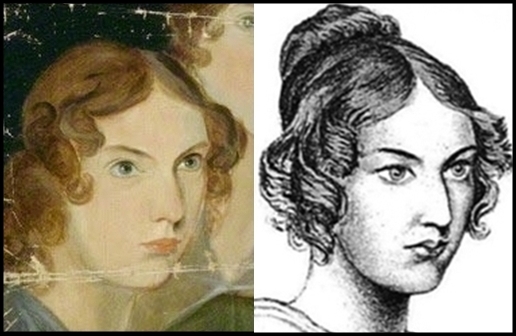 The figure on the far right is of course Charlotte Bronte, not Aunt Branwell. Her widower, Arthur Bell Nicholls, refused to recognise any image of his wife other than the Richmond Portrait which he had authorised to be published in the biography of 1857. "carefully and accurately copied by Miss Preston from a picture which came to me from Haworth with good credentials as to authenticity. The original was submitted to the inspection of Martha Brown, the Brontë housekeeper, and admitted by her to be a tolerably faithful portrait. The picture formerly belonged to a member of the Brown family, of Haworth, who always regarded it as a good likeness. On the strength of this evidence, and notwithstanding Mr.Shorter's opinion that the quest for an authentic portrait of Emily Brontë now seems hopeless, I have felt justified in giving the portrait a prominent place in my book." The "picture which came to me from Haworth" was the photo of the Pillar Portrait as published in Woman at Home the previous year. The evidence for this is in the blemish - a dark patch - above Anne's head in the photo. This has been mistaken by the artist for her hair and is drawn as a bun. The blemish doesn't appear in the original portrait painting. "The original" was the "Photo on glass of the Pillar Portrait" which wasn't "submitted to the inspection of Martha Brown" because she actually owned the photo. Martha wouldn't have seen Miss Preston's portrait as it was created in 1897-8 and Martha had died some 17 years earlier, in 1880. The "picture [which] formerly belonged to a member of the Brown family" was the photo, not the original portrait painting, that was with Mr Nicholls in Ireland. 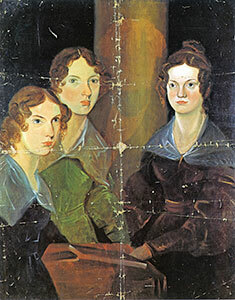 It was not known that this was the 'Pillar Portrait' described by Elizabeth Gaskell in 1857; she identified the sisters left to right as Anne, Emily and Charlotte. Publication of this portrait over the past 120 years has led many people to believe that Emily had an aquiline nose and resembled her sister, Anne. Anne in the original 'Pillar Portrait.' Right: The illustration of 1898.